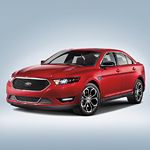 The Ford Taurus has long been a popular vehicle for anyone interesting in driving a reliable and comfortable mid-size sedan. At Honolulu Ford, we're always happy to recommend this vehicle to our customers in Honolulu. The modern-looking Taurus is classy. On the outside, strong sculpted lines add to its aerodynamic appearance. All of the angles end up converging at the rear of the car, where dual chrome exhaust tips are a nice finish. There are several different wheel choices, from 18" silver-painted aluminum ones to 20" black-painted machined aluminum wheels. Inside, things are quite comfortable. Some of the Taurus trims come with heated and cooled front seats along with a dual-zone climate control. Ambient lighting strategically placed throughout the cabin provides just enough light to see, and it adds to the elegance of the interior. There are even choices in terms of what color LEDs you prefer.